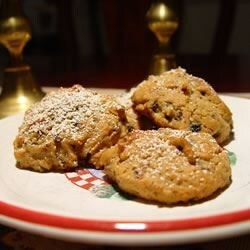 "Add more mincemeat or a pinch of other spices to change the flavor of these cookies." Cream shortening, sugar and eggs together, then beat in vanilla. Sift the flour, salt and baking soda together, and add to shortening mixture. Mix until well blended. Stir in the nuts and mincemeat and mix well. Drop by teaspoonfuls on the cookie sheet. Bake 8 to 10 minutes until light brown. Excellent cookies! Couldn't stop eating them. my mother made these for us when I was little. I needed a take me home moment and these cookies did the trick. they are wonderful.